Flattery aside, as an author and educator, I always appreciate shoutouts like these, and I was a bit dismayed that I had not yet heard about the book. 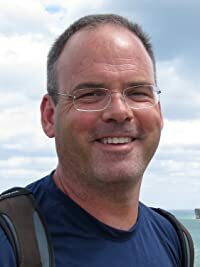 And, after a quick hop to the Amazon website where I previewed the book and read a review, I could tell that my own ideas about teaching reading and writing were, indeed, in line with those of Katie Stover and Lindsay Yearta. With that knowledge in mind, I asked Stover if I could take a look at the book and, thanks to Solution Tree Press, my own copy arrived just a few days ago. 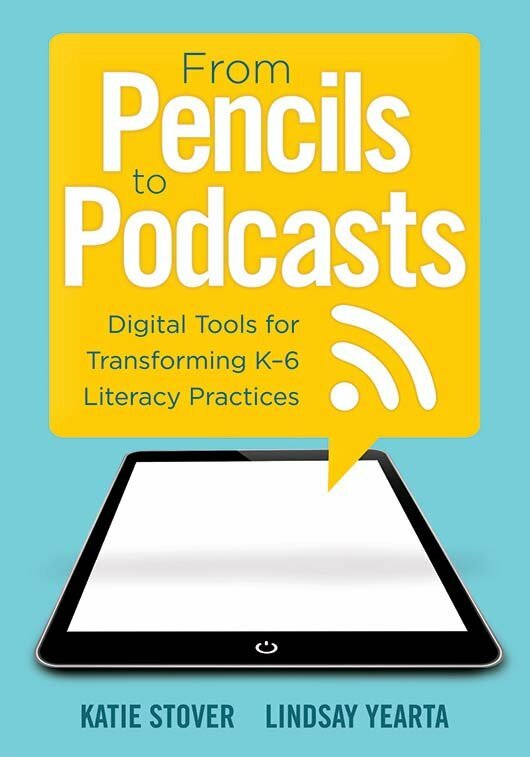 And, in much the way that Stover described the teacher’s endorsement in her tweet, I would certainly agree: From Pencils to Podcasts is a book that adopts the same stance toward reading, writing, and digital literacy that I, too, hope to imbue in my own work. From the opening pages, the authors articulate their belief that “[t]echnology, when used intentionally, enhances teaching and learning as students have more opportunities to create, collaborate, communicate, and share” (6). I couldn’t agree more. Throughout the early pages of the introduction and into the fourteen chapters that follow, Stover and Yearta offer a variety of digital reading and writing tools that will be useful to elementary-level educators. The book is segmented into four major parts. In part one, Stover and Yearta focus on tools to facilitate comprehension and analysis. Here, the authors provide many examples of teachers and students at work, as well as descriptions of the technologies that they employed. I was most intrigued by an example where a fifth grader and a college student discuss the shared reading using Edmodo. At one point in the dialogue, the college student records herself on video providing an additional response and clarification for her fifth-grade reading buddy (25). These types of small, yet powerful, examples are sprinkled throughout the book and demonstrate how readers and writers can flourish when supported through effective teaching and creative applications of technology. Also, Stover and Yearta provide links and QR codes throughout their book that lead directly to the apps/websites being mentioned, and they also have created a companion webpage with those links conveniently listed along with reproducible handouts. In the second part, Stover and Yearta move on to discuss tools that can facilitate evaluation and revision. Again, the authors provide a number of different lesson ideas and technologies as examples, and one of the most unique twists is the application of digital video to the classic strategy of “reader’s theater.” They describe the ways in which students develop fluency as they engage in multiple readings of their selected book and, ultimately, produce and publish their own interpretation of the book using digital video (70). The third section of the book offers even more opportunities for teachers to think about performance and publication as Stover and Yearta explore infographics, digital story retelling, publishing with a digital book creator, and incorporating speech-to-text dictation. Similarly, the fourth section pushes teachers to think creatively about new applications of existing technologies such as using timeline tools to create reading histories, conducting digital conferences using tools like VoiceThread, and composing digital portfolios with Seesaw or Weebly. Additionally, throughout the book, Stover and Yearta share many case studies of teachers using tech in critical and creative ways. For instance, in the final chapter on formative assessment, they invite us into the classroom of Katharine Hale, exploring the ways in which she uses Lino and Padlet as spaces for students to capture their reading ideas, questions, and connections in-process. On the whole, Stover and Yearta have designed and delivered a very useful book. My only concern is this: while the authors do present many examples from students and teachers, especially text-based examples such as digital discussion boards, as well as screenshots of the interfaces for various websites and apps, my one hope would have been to see more examples of student work, both in the book as well as through hyperlinks on the companion website. For instance, Stiver and Yearta share overviews of many tools including infographics, digital movies, and a book creator app, yet the reader is left to her own imagination in order to visualize what these final products, created by students themselves, would actually look like. In other words, it would be helpful – especially for teachers new to digital reading and writing – to see even more examples of how students were able to utilize these tools in different ways, and to have them available online as mentor texts that teachers could click on and share in their own classrooms. If a teacher is new to using 1:1 technology, the book offers numerous ideas that will be adaptable across grade levels. And, even if a teacher is familiar with many of the apps and websites, Stover and Yearta provide new insights into the ways in which these tools can be used. For any book that is written for teachers, it is a challenge to create a resource that is overflowing without being overwhelming, and with From Pencils to Podcasts, the authors have certainly accomplished their goal. I am, indeed, flattered that a teacher has compared my work to theirs, and I appreciate their insights into the connection between emergent/early literacies and technology. For any K-6 educator who is new to using technology in her classroom – or wants to look at integrating technology with a fresh set of eyes –From Pencils to Podcasts should be on your summer reading list. Disclaimer: At my request, I was provided with a free copy of the book by Solution Tree Press. This week, I am happy to be one stop on the blog tour for Jeff Anderson and Deborah Dean’s new book, Revision Decisions: Talking Through Sentences and Beyond (Be sure to visit stops one, two, and three for some great insights from Stacey, Sarah, and Donalyn, too). In interest of full disclosure, I was provided an advanced copy of the book by Stenhouse, though I have long been an admirer of Jeff’s work to effectively integrate grammar instruction into the writing workshop and Deborah’s work on genre study and best practices in writing. More importantly, even though I got one for free, you can win a copy, too… read on! So, it was my pleasure to read their book and converse with them about some related topics. First, a quick overview of the book from the perspective of an English teacher who was always reluctant to “teach grammar.” I tried to integrate grammar instruction into my mini-lessons and conferences with students, but very rarely could I get beyond the idea of simply introducing my middle schoolers to using commas in a series or, if I was really lucky, to add an appositive phrase. Jeff and Deborah have provided teachers with a road map for how to make grammar instruction, through an alternative form of sentence combining, much more effective than simply winging it during those teachable moments and hoping that something would stick. Indeed, Revision Decisions provides us with the theoretical and practical glue to make grammar lessons meaningful and memorable. Then, in the second half of the book, our co-authors walk us through a number of “lesson sets” which explain these revision decisions in more detail. All in all — and not just because I am a big fan of their previous work — I can say that Revision Decisions will guide my teaching practice as I continue to think about how sentence combining (and, as Jeff and Deborah show, “uncombining”) can be a great teaching strategy. Question 1: First, as we consider the many ways in which students knowledge of grammar could be assessed, part of our reality is that the new common core tests, as well as other high-stakes tests such as the ACT, are asking students to identify grammatical structures and problems and then reply to a multiple-choice question. How do you balance teaching “revision decisions” with authentic pieces of student work against these constraining types of test questions? In what way are we able to have students transfer their knowledge of grammar from their “revision decisions” into the reality of test prep? The cool thing about the concrete acts modeled and experimented with in Revision Decisions is that they are based in a sound research-based instructional methods and help prepare kids for test. Sure, it will work best for critical thinking, revision, and sentence combining questions that students are sure to encounter. It’s not so much about editing; however, since we only use grammatically correct sentences to play with and combine, they are getting exposure to correct texts as they reformulate and revise. Thinkers. That is what we want our students to be in our classroom, in the world, and even on tests. Thinkers. Thinkers evaluate what best communicates and idea, analyzing, testing it. This is all built into the lesson cycle or progression in Revision Decisions. Based in the Writing Next research on sentence combining, study of models, and collaboration, students will think. Thought requires flexibility, risks, and options. We demonstrate options, we allow students to tinker with and combine sentences, all in the name of making beautiful, rhythmic sense. 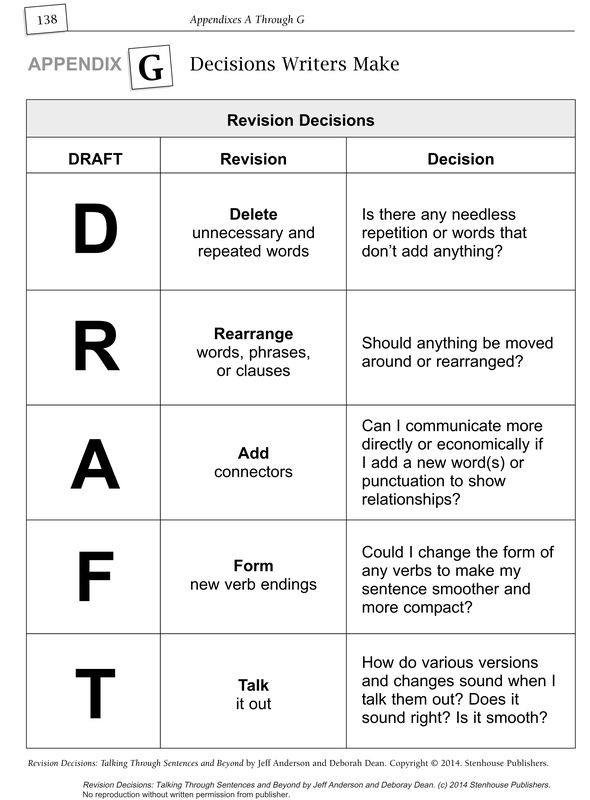 The concrete doable actions of the DRAFT mnemonic let young revisers in on the concrete things they can do (options) to create effective prose: Deleting, Rearranging, Adding connectors, Forming new verb endings, and the essential piece of Talking it out. Luckily higher standard tests won’t ask students to identify a part of speech or structure, but the applied knowledge they’ll get from sentence combining and revising will set them on a path for success. One of the ways I would say the work we present in the book helps prepare students for testing is that Revision Decision work is consistently putting options about writing in front of students and asking them to consider the effects of the different choices, much as the test does. As students and teachers work with making writing choices (revision decisions! ), they consider effects, to be sure, but they also consider issues of clarity and, in some cases, correctness—issues the tests focus on. All of these are elements of the decisions writers make. In our classroom talk about choices and effects, a certain amount of talk about correctness is sure to come up: it is, after all, something readers might expect in some writing situations and it is possible for writers to violate expectations for grammar when they are playing around with parts of sentences. Therefore, correctness (or lack of it) also creates an effect that writers need to consider in revision. There is room in this practice for helping students get ready for tests; it is just woven into the talk and decision-making about sentences. Long answer put short: although we don’t focus on correctness directly, it will certainly come up in discussions of choices and their differing communicative effects. Question 2: Second, just as the Writing Next report indicates that isolated and grammar instruction has a neutral to negative effect on students writing, it also notes that word processing has a positive effect. How could a teacher transfer some of the ideas that you both have shared in your book to a technology–infused lesson? What might you suggest for teachers as they help students use word processing for smarter revisions? Ack. This one is hard for me. I have lost many a good idea by revising on a word processor program. I do think it’s handy for small stuff, but I have lost things too. I almost always print my writing out at some point, open a new file, copy and paste the section in need of revising. When and if it works, I paste it into my doc. So I guess, sharing my process isn’t a bad way to do that. Wait, I am sharing my own process discovery. That’s writing process, by jove. Also considered a huge plus in the Writing Next research report. It certainly seems to me that the practice we present in the book works with students who are word processing as well as, if not better than, for those who are writing out their sentences. In fact, one of the challenges of this work is that when students are handwriting, they sometimes don’t like to make multiple versions, “writing the same words over and over.” Some of my students acted as though the physical act of writing was almost painful in these instances. For those students, being able to copy and paste to move sections of sentences around would be a great benefit, allowing them to create more ways to frame the ideas of a sentence with relative ease. An additional benefit that is available for handwriting but that may be a little less noticeable is the way that copying and pasting helps students to see how ideas group themselves into grammatical structures for movement. It is easier, I think, for them to see a prepositional phrase or verb phrase as a unit if they are moving chunks with a word processor. Question 3: Finally, though I’m sure it is difficult to pick only one, what grammatical structure do you think most students could learn to use in order to add power and voice to their writing? What is it about that particular grammatical structure that you find so useful? Do you have an example of how an author has used that grammatical structure in a book, essay, or poem? A rat can collapse its skeleton, allowing it to wriggle through a hole as narrow as three-quarters of an inch. The main clause is really expanded by the right-branching modification. This is true in appositives or participial phrases or any other appropriate structure. I don’t know for sure how to write the sound I just made. It’s a little like asking which is my favorite child. Impossible to answer. But, okay. I don’t know what Jeff would say, but I would go to participial phrases, I guess. (As soon as I say that I think of dozens of others—should I say appositives????) Why do I find them useful? They allow me to add details; in fact, if I’m thinking about using them, I usually add details I might otherwise leave out, adding those details in concise ways, without duplicating words or making placeholders necessary. I always remember a passage of Where the Red Fern Grows that we use on pages 103 and 104 in the book. It’s a passage that shows how powerful participles can be (and so does the example on page 105 from Sheinkin’s Bomb). Participles and participial phrases are useful in so many places and in so many texts. We have lots of examples in the book of them—I guess both Jeff and I really are drawn to them. This giveaway is for a copy of Revision Decisions: Talking Through Sentences and Beyond, courtesy of Stenhouse Publishers. For a chance to win this copy of Revision Decisions, please leave a comment on this post by Monday, November 17th at 11:59 p.m. Eastern Time. I’ll use a random number generator to pick the winner, who will be contacted via email. Please be sure to leave a valid e-mail address when you post your comment, so I can contact you if you win. Stenhouse will be shipping the book to you, so I will share your mailing address with them. Thanks to Jeff and Deborah for their timely, useful, and fun approach to teaching revision! In and amongst all of these activities, I have been reminded of the power of teacher networks. In fact, my entire professional life centers on the idea of teacher networks. Identifying networks. Building collaborations. Nurturing novice and veteran teachers alike. Putting them in conversation with one another. Asking smart questions about curriculum, instruction, and assessment. Creating new networks, and beginning the process again. It’s part of who I am, part of what I do. 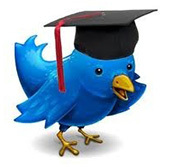 In that sense, part of what I am attempting to do with my pre-service teachers this semester to do — through the use of Twitter — is to build a teacher network. I am not simply asking them to “use Twitter.” Instead, I am coaching them in the process of using Twitter as a tool for building their PLN. This happens both online and off. As evidence of this, I spent about 20 minutes of class time last week introducing some of the nuances of Tweetdeck as a tool for monitoring and participating in hashtag conversations. At the core, what I am attempting to do with my pre-service teachers is about using technology in a way that moves well beyond simplistic integration. As Ruben Puentedura describes it in his SAMR model, I want pre-service teachers to move from technology as a tool for enhancement of teaching practice into an opportunity to transform their practice. Yet, I find my pre-service teachers, even the most engaged Twitter users amongst them, to be hesitant about using social networking in this manner. Of course, change is hard, and I am working to ease them into it. I want to provide them with the opportunity, yet not foist Twitter upon them. At the same time, we cannot move fast enough. There are so many conversations, so many ideas that they need to jump into, so many networks that they can learn from. Indeed, my colleagues in teacher education could take a play from the Twitter/PLN playbook, as I do not often see teacher educators participating in regular conversations. There are exceptions, of course, but when I was in a recent college of ed meeting about reforming our teacher ed program, no one presenting mentioned how we could tap into these existing networks as a way to recruit mentor teachers, build school partnerships, and learn about current trends in the field. Many of my colleagues need to rethink how they, too, participate in networks as a broader component of their own (and their pre-service teachers’) professional learning. At this point, I am still pushing forward with Twitter outside of my methods class, though I think I might use it in class next week to hold a backchannel conversation, too. I’ve resisted the urge to place any kind of grade on Twitter participation, though I have told students that they will be evaluated on their participation in class, both at the mid-term and at the end of class. So, I will keep working to get them involved, and to get other teacher educators involved, too. This fall — in fact, tomorrow — marks my return to the classroom after a year-long sabbatical filled with many research projects, lots of writing, and quite a bit of travel. Like most teachers, I both crave and fear the “regularity” of the school; the days become somewhat more regimented, but the overall craziness of our lives seems to intensify. There are many additional projects to discuss in the year ahead, yet pressing on my mind at this moment is how to invite my pre-service teachers into the broader conversation(s) that happen amongst educators via blogs, Twitter, and other online communities. Over the past seven years of working with pre-service teachers, I have dabbled with a variety of digital reading and writing tools, consistently returning to the use of wikis and Google Docs as mainstays in my ENG 315 course. Early on, I integrated blogs and RSS, later trying other elements like podcasting, digital storytelling, and social media/classroom management hybrids. Yet, I haven’t had them fully jump in to the world of Twitter or edchats. Perhaps this is because, first, when I taught my last course in the spring of 2013, the real explosion in edchats had yet to really hit. Perhaps it was because I felt we were crunched for time in an already-crowded curriculum. 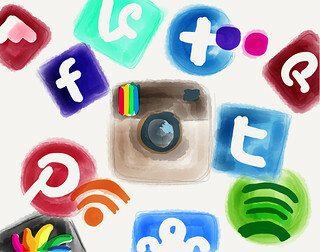 Perhaps I was having trouble making a clear connection between digital writing and social media. Well, edchats are here, the curriculum will always be crowded, and I wrote a chapter in a book about the composition processes of social media. So, I suppose that this semester is as good as any to invite my students to jump in. How do I scaffold and layer their experiences with social media over the course of the semester? What authentic and useful tasks can I ask of them as a part of normal course work (for instance, to discuss readings or find relevant new articles)? How can I encourage more authentic participation in edchat communities that moves beyond what the are “supposed” to do for class? I know that I can take some of my own social media advice in terms of what I have previously suggested to other teachers, but I think that pre-service teachers are a slightly different audience. As I mull this over in the next few hours — I teach tomorrow afternoon and I am wondering where to begin — I would be curious to know what my colleagues, especially teachers of high school students and undergrads, have done to thoughtfully, critically, and creatively introduced social media into your classrooms? Any advice before I stand up to start teaching tomorrow? In the past two weeks, I’ve had to wonderful opportunities for writing, one through my colleague Todd Finley via Edutopia, and the other from a group of English educators via their Writers Who Care blog. Here is a brief preview from each, as well as links to the originals. One of my ENG 315 students presenting part of her multigenre research project. As a writer, I know firsthand how important it is for me to share what I’ve written and receive feedback on my work. And as a teacher of writing — from my initial experience in the middle school classroom up to my current work as a teacher educator at Central Michigan University and director of our Chippewa River Writing Project — I want my students to experience this, too. It is with this understanding in mind that I teach my methods course, ENG 315: Writing in the Elementary and Middle School. While I am very much an advocate for digital writing that incorporates multimedia content such as audio, video, and images, I also understand and appreciate the idea that writing involves — and should always involve at some level — the use of words. Very rarely, if ever, does a young writer need all the bells and whistles that come with standard word processing software. This is especially true when it comes to using a tablet, given the limited amount of space we have for viewing and typing on smaller screens, especially when not using an external keyboard. Hope that you find the articles useful! Though I am a little late to the MOOC movement, I’m excited to be participating in a venture this fall — K-12 Teaching in the 21st Century — that will be facilitated by Rick Ferdig, Kristine Pytash, and a host of other educators from around Michigan. Here is a quick summary, and you can register on the MOOC’s main website. This free course runs from October 7 to November 8, 2013. It is aimed at high school students, pre-service teachers and in-service teachers who are interested in a conversation about using 21st century tools for teaching. My hope is that we can use the MOOC to foster rich dialogue about the nature and uses of digital literacies, looking for themes within and across the experience of teachers at various stages of their career and in different professional contexts. More on this next week as we get closer to the October 7th kick-off date.